What is RSS? RSS feeds enable web sites to tell you when they have new articles. Instead of constantly visiting your favorite web sites to find out what's new, you simply subscribe to them in your RSS reader, and new articles come to you automatically. Unlike email, RSS is private - the sites you subscribe to know nothing about you. 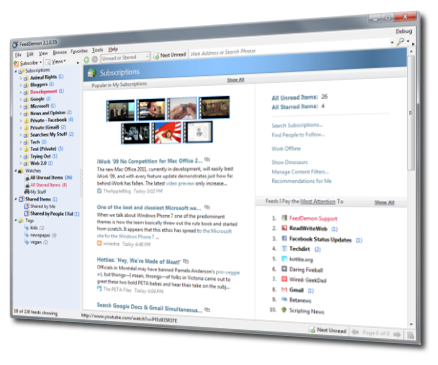 FeedDemon was discontinued in June 2013. You can still download it for free, but it won't be updated and support for it is no longer available. FeedDemon is the most popular RSS reader for Windows, with an easy-to-use interface that makes it a snap to stay informed with the latest news and information. Assign your own keywords to items, making it easy to classify and locate articles you've previously read. Tell FeedDemon to let you know when your keywords appear in any feed you're subscribed to. Get alerted when your keywords appear in any feed, regardless of whether you're subscribed to it. Let FeedDemon automatically download audio files and copy them to your iPod or other media device.